Although warm weather is a great excuse to wear maxi dresses, shorts, rompers and all manner of delightful summery garments, the piece I seem to reach for time and again is the yellow Japanese doll print skirt I bought at Anthropologie last winter. Unfortunately it's no longer available, but luckily for those who are looking for their own full cotton skirts with hidden side pockets, Anthropologie has an abundance of them in every colour and pattern this season. What's not to love about this style? The voluminous A-line silhouette accentuates a small waist and looks great with tank tops, silk blouses or plain tees tucked in. It goes with ballet flats, kitten heels and casual sandals. The cotton is light and breezy. And to top it off, the side pockets are great for small sundries like lip balm, keys and a pair of sunglasses. (The skirt puffs out enough to hide the telltale bulge of your Wayfarers.) All in all, it's the perfect skirt for impromptu walks to the gelato place down the street, a lazy Sunday afternoon at the movies or a sunny stroll through the park with your dog. Here's to spontaneous summer adventures in a skirt that won't slow you down. 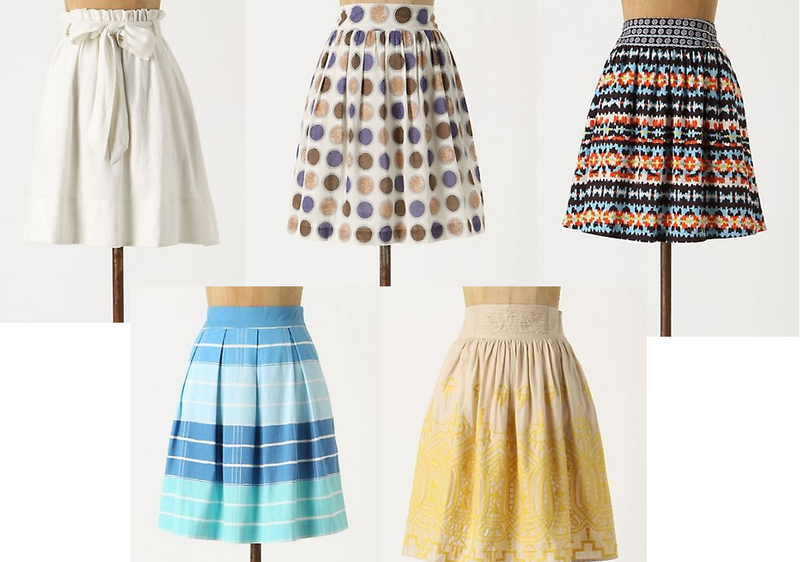 Anthropologie does have some super cute skirts for summer - I like the ones you picked! What tops would you wear with them? I really like these skirts and the fun prints, not sure if I can pull them off though! I like the one with the dots.